If you were a child of the ’90s then you have fond memories of cartoons such as Tiny Toons, Batman the Animated Series, Spider-Man, and Animaniacs. Maurice LaMarche, Rob Paulsen, Jess Harnell and Tress MacNeille are a quartet who were a big part of that era. They have become industry legends, with a slew of acting credits under their belts. 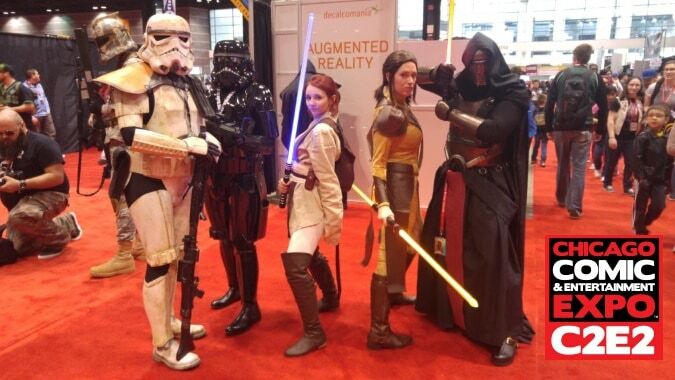 PopCultHQ had a chance to briefly talk to them at C2E2. 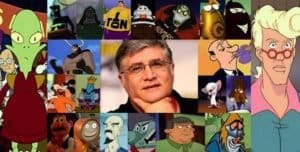 Maurice LaMarche is an Emmy-winning voice actor with a huge repetoire. His roles have included Inspector Gadget, Dennis the Menace, Slimer! And the Real Ghostbusters, Animaniacs, Pinky and the Brain, and various characters in Futurama. 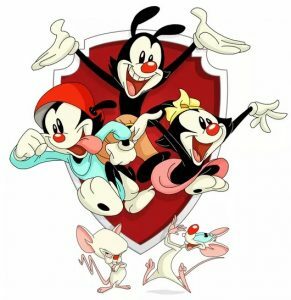 PopCultHQ – Animaniacs is going to be getting its proper reboot next year in 2020. I got a big question for ya. If you could be a part of any show again that you worked on in the past, what show would it be? And there’s no wrong answers here obviously. Maurice LaMarche – No obviously Animaniacs, right up there. And we’re keeping our fingers crossed that they ask us to be part of it. So we’ll see what happens. PopCultHQ – As more viewers discover the projects you’ve been a part of over the years, what do you hope they take away from watching any of your work? Any of your body of work. Maurice LaMarche – That it’s fun. That there’s a real love of the craft of voice work. And laughter, the most important thing. That’s the main reason to do it. Other then there’ve been some dramatic things I’ve done like Mr. Freeze in the Arkham games is very simpatico kind of character, he’s got a tragic backstory. You know look, we’re entertainers. I call that the ‘taking peoples minds of their problems business’ and that’s all I’m here for. I’m here to just help you forget your day to day stuff and escape a little bit, whether its through humor, whether its through drama. So that’s what I want to do with my talent, whatever form it takes. PopCultHQ – Last question. Now looking at your career over the years, is there any role you’ve done that you enjoy the most. Maurice LaMarche – Well I love Brain. Brain is probably closest to my heart. I will tell you that on The Critic, remember the amount of plate-spinning that I had to do playing all those characters and having the best friend character as well in there was so much fun. Such a challenge. And to work with Al Jean and Mike Reiss on their original show and have such fantastic material was a joy and a blessing. And that’s the other show I’d love to see come back and be a part of. If they ever resurrect The Critic, I’d love to be a part of that again. 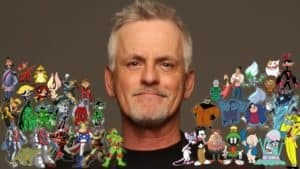 Rob Paulsen is the voice you didn’t know you knew. He has voiced over 250 characters and 1000 commercials. He has more shows than we can list, but a few of the ore popular ones include Teenage Mutant Ninja Turtles,Rick and Morty, Ultimate Spider-Man,Mickey Mouse Clubhouse, The Powerpuff Girls and The Real Adventures of Jonny Quest. PopCultHQ – Animaniacs is getting the proper reboot in 2020. If you could pick any other show you’ve worked on in the past, to be a part of again, if it was also getting a reboot, what show would you want it to be? Rob Paulsen – Oh gosh, I’d say, Biker Mice from Mars which took place in Chicago. Or Mighty Max, Mighty Max was a great show. I’ve done Turtles a couple of times, you know I’ve just been a profoundly lucky guy. And Jimmy Neutron. PopCultHQ – As future generations discover the work you’ve been a part of over the years, what is something you hope that they will take away from these shows? Rob Paulsen – Uh, joy. I hope that the overarching takeaway from any of the things on which I work is joy. My job, not even essentially, my job is, to create characters by large which create happiness oftentimes among a number of generations that share these characters with each other, with their parents and their children and their grandchildren. I honestly can think of nothing that is more worthwhile of my time. And it’s a glorious legacy to be able to work on things that will make people smile and laugh together long after I’m dead and gone. PopCultHQ – You’ve worked on a lot of great shows over the years and you’ve had a lot of great roles. Who is a character, and there’s no right or wrong answer to this question obviously. Who is a character is one you’d say you love the most, up to this point? Rob Paulsen – It is a tough call. I would say that, if I had to make a choice, it’d be tough between Yakko and Pinky. Because of the, not only the content, and everybody with whom I’ve worked, they’re always nice. Honest to God I could count on one hand, one finger the number of people I’ve worked with who have been difficult, everybody is lovely. But Animaniacs and Pinky and the Brain are remarkably good shows that have withstood the test of time and a testament to Tom Ruegger and Steven Spielberg. But I get to sing, In Pinky’s Voice I get to work with my friend Maurice LaMarche who’s a genius In Yakko Warner’s Voice and my friends Jess Harnell and Tress MacNeille and live in the water tower and take over the world so what’s not to like it’s pretty great. 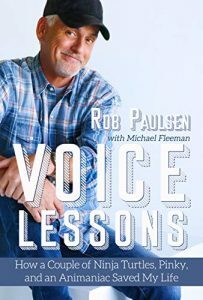 PopCultHQ – You just announced that your memoir Voice Lessons is coming out this fall, with Michael Fleeman I believe. What can we expect in this account of your life and career to this point? Rob Paulsen – Thank you for asking Josh. Yeah it’s called Voice Lessons. And that title is not meant to mislead. The truth is that I’ve learned a lot via my voice about the power of the characters that you’re kind enough to ask about. And this book is about how those characters, in the context of what they’ve meant to so many people, in their own personal struggles, turned out to mean an awful lot to me as well because I went through an experience with throat cancer three years ago and I learned an awful lot during my experience about how important these characters were to other people and by extension me. It’s a really remarkable story. 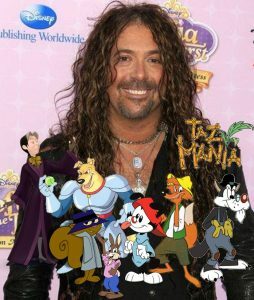 Jess Harnell is best known for voicing Wakko Warner in Animaniacs and Crash Bandicoot in the video game franchise of the same name, but he has also voiced Scary Terry and Ironhide. Harnell is also the current announcer for America’s Funniest Home Videos. PopCultHQ – If you could go back to any show that you’ve worked on over the years that has been off the air and be a part of that again, what show would you pick and why? Jess Harnell – You know man, the best part of the job is that there’s always new stuff coming up. And I’m always just happy about being a part of anything that makes anyone happy. I love the fact that they brought back Animaniacs and Crash Bandicoot. There was a show called Road Rovers that was produced by the same people that did Animaniacs and a lot of my buddies were on that with me like Tress MacNeille and Jeff Glen Bennett, Kevin Michael Richardson, it’d be fun if they brought that back, it was a cult show. But everything I do is so much fun I just can’t believe I get paid for doing this. PopCultHQ– When people find work that you’ve been a part of over the years, what is something you hope they take away from that whether its your work as Scary Terry or Animaniacs or anything. Even Adventures in Odyssey as Wootan Bassett. Jess Harnell– Yeah, but you know what, I mean, even hearing you list the credits what’s nice is that it’s such a diverse group of characters and such a diverse group of product. I just hope the same thing which is that whatever I do makes somebody happy. Because the world is full of a lot of hard stuff and a lot of hard hard things that happen to people, and if you can be a part, even you guys reading/listening, in everyday, of making somebody’s day a little bit better instead of a little bit worse then that’s amazing. And I’m just so proud of the fact that hopefully even though it’s not brain surgery and its not saving the world, maybe made some people smile and that’s not a bad legacy. PopCultHQ – Looking at your career over the years, is there a particular character that you love the most and have loved working as the most? Jess Harnell – There’s a show called Doc McStuffins that I do where’s a little character named Chilly the Snowman and he’s this guy. And he make’s kids less afraid to go to the doctor and less afraid to be sick. Wakko just makes people laugh out loud because he’s so crazy. Wootan is so pure of heart and such a sweet person. Scary Terry even as screwed up as he is he’s still funny. So, they’re all like a group of my friends that I carry around with me in my head and then pop out of my mouth sometimes and I love every one of them. 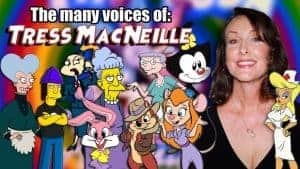 You may know Tress MacNeille as the Mom on Futurama, Babs Bunny from Tiny Toons Adventures, Daisy Duck, a host of characters from The Simpsons, but we know her and love her most of all for being Dot Warner on Animaniacs. PopCultHQ – C2E2 is a big show and so how does it feel being here with all of your colleagues here in Chicago? Tress MacNeille – I love the energy and the people here are so happy and everybody’s having a good time and there are no fights or anything, and so, and plenty of good food. So you know we’re feeling good. It’s always nice to get out of the house right? PopCultHQ – I’ll say amen to that. Now Animaniacs is getting the reboot in 2020 but you’ve worked on a lot of shows over the years. If you could take any other show that has been off the air for a long time to make a comeback, what would you wanna do, like what show would you wanna do to make a comeback? Tress MacNeil – Well I would have to say Futurama, I always think it is gonna come back. We are kinda doing a new Futurama now with Disenchantment. You know with Disenchantment its Matt Groening’s show and a lot of the writers are the same, the comedy is very similar. Billy West is on it, John DiMaggio, Maurice LaMarche, Dave Herman. You know a lot of excellent excellent people. Its always fun to get back into the studio with those people. Though I do that with Disenchantment. But I’d like to do Futurama because I never get tired of Futurama. Animaniacs, coming back. Simpsons has never gone away. And of course I’ve been Disney classic characters since the mid-80s. And that goes for ever and ever and ever. And so I don’t have to worry about bringing anything back because its never gone away really. PopCultHQ – That’s true. As future audiences discover the work you’ve been a part of over the years what is something you hope they’ll take away from it. Not even a moral lesson but just like a value for it. Tress MacNeille– I think maybe one of things I appreciate about the cartoons that we did is that they weren’t lewd and snarky or mean and they weren’t political. You know they were just good simple fun, upbeat, funny, smart. A little something for everybody, something for the adults, something for the kids and beautifully drawn and great music and you don’t have to be sardonic to be current or on the air. Cartoons don’t need it, not all of them need it. Be sure to keep your eyes open for the new Animaniacs coming to Hulu later this year. 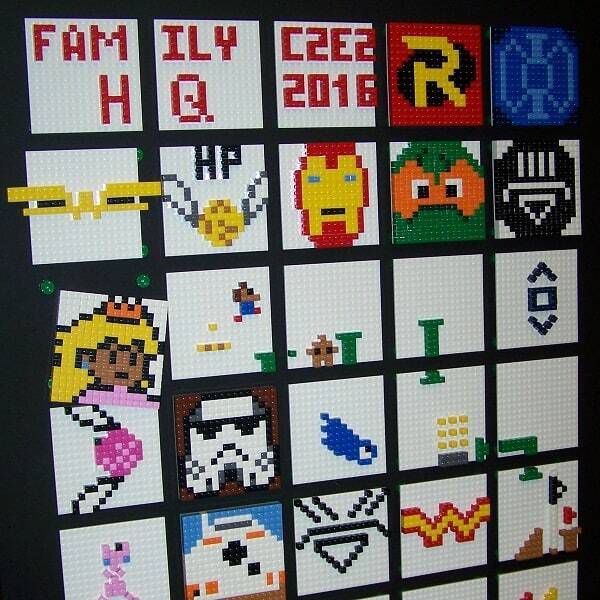 C2E2 Family HQ was Great! March 24, 2016 April Carvelli Conventions, Cosplay Comments Off on C2E2 Family HQ was Great!